Hello and welcome to Flawed yet Functional! 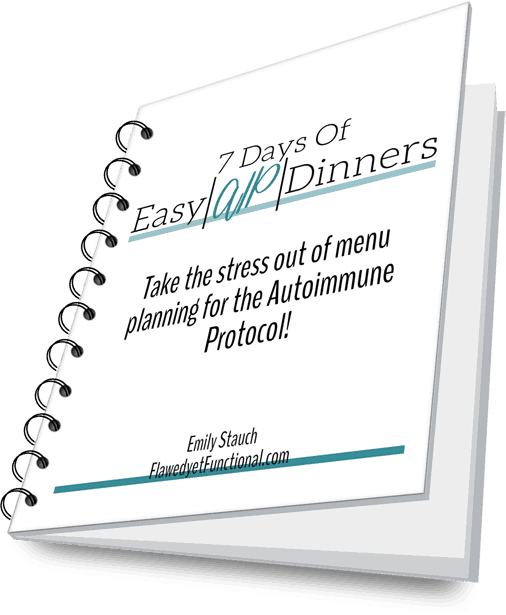 I am Emily, a Type 1 Diabetic using the Autoimmune Protocol to manage blood sugar levels. Eating AIP was a big adjustment for me. The biggest thing I needed to learn was how to incorporate more vegetables into my diet, and I found roasting is by far my favorite way to eat any vegetable. Today I’d like to show you a simple side dish that I make at least once a week: Bacon & Garlic Roasted Broccoli. This recipe is not just for broccoli! Substitute any vegetable, and I’m sure you’ll enjoy it! Butternut squash, sweet potatoes, cauliflower, beets…the sky’s the limit! Roasting vegetables is a simple way to enhance any vegetable. In case you are new here, check out the basic steps of roasting vegetables below. Place pieces in a bowl. Toss with fat and seasoning to suit (Just salt & pepper is so good!). Roast at 450° for 15 minutes. Stir then continue roasting until desired tenderness, usually about 15 more minutes. Seriously, that’s the way to make any vegetable awesome. For today’s recipe, I will stick with all dried spices to make the broccoli come together as quickly as possible. Check out these recipes for more roasted vegetable goodness: Turmeric & Garlic Butternut Squash, Roasted Brussels Sprouts, Roasted Squash & Sprouts, and Cinnamon Sweet Potatoes! The fat I chose this time is bacon fat…because it’s delicious! I always keep the fat from baking bacon and use it in my cooking (Example: Ham and Parsnip Soup or Roasted Brussels Sprouts). If you haven’t started the habit of keeping the rendered fat from bacon, start today! It will change you life. I do not exaggerate. However, you don’t have to use bacon fat. Just use whatever fat/oil you have on hand! Olive oil or avocado oil are mild options that will not conflict with the flavor of the spices. I wouldn’t use coconut oil as to me it’s slightly sweet, but in a pinch, that would be great too! If you are trying to get more vegetables into your diet, experiment with roasted vegetables first. Cooked veggies are always easier to eat than raw, and seasoned dishes, like this one, are a super tasty way to begin eating more vegetables. Trust me folks, once you get the standard American diet of carbs and sugar for breakfast out of your head, you’ll find that all the food you find delicious for lunch or dinner is delicious at breakfast too! Give this one a try with a side of fresh berries and bacon or breakfast sausage! So to bring it all together: roast your veggies, put bacon fat on everything, and eat more vegetables! You can do this thing called “eating healthy!” I hope you are inspired to step out of your comfort zone when it comes to vegetable selection and cooking. Give Bacon & Garlic Roasted Broccoli a try for breakfast, lunch, or dinner! Need a quick vegetable side that doesn’t require fresh herbs, odd vegetables, or much prep? This easy roasted broccoli is for you! Using only dried herbs and fat you can create this delicious side dish in under 40 minutes (with less than 5 minutes of work!). Preheat oven to 450°. Line a rimmed baking sheet with parchment paper. In a large mixing bowl, add all ingredients, and stir to coat. I buy broccoli pre-cut to save time, but you can start with broccoli crowns, just chop into similar size pieces. Add enough fat/oil so that the broccoli glistens but fat/oil does not pool at the bottom of the bowl. Start with 2 tablespoons and add more as necessary. Spread into single layer on baking sheet then roast for 15 minutes. Stir and continue roasting until broccoli is brown and crispy on the edges, about 15 more minutes.